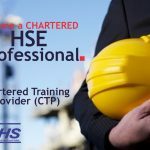 If you’re working in environmental health and safety, gaining a health and safety qualification, or you has simply got an interest in this industry, you can join CIEHS Chartered Membership. How far you take your qualifications and membership status is entirely up to you. A student member shall be a person not under 17 years of age who at the time of application satisfies the Council that he has received a good general education and is studying subjects related to environmental health and safety management. A student member shall transfer to the grade of Associate Member after graduation provided he or she is suitably qualified and as soon as he or she is earning a full-time salary. A Student shall not become member of the Institute without the prior approval of the Vice-Chancellor or Head of Department of the university or relevant authority concerned. The Institute will recognize undergraduates of Universities, higher Institutions, professional institutions and societies for Affiliate membership. Student Members of any recognized professional institutions and societies can become Affiliate Members of the Institute with payment of annual subscriptions only. 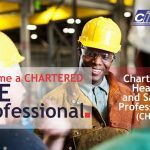 A person at least 20 years of age, who possess an interest in environmental health and safety management but have not acquired the necessary experience or obtained the qualifications, governing entry to Membership grade. An Associate Member, on obtaining the necessary qualifications, may apply for upgrade to Chartered Membership grade. 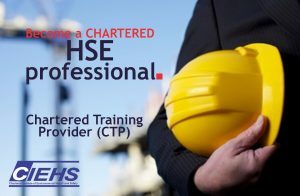 National Safety Management Society, American Society of Safety Engineers, National Safety Council, Nevada SCATS, OSHAcademy, Wisconsin Indianhead Technical College, Texas Engineering Extension Service, College of Southern Nevada OSHA Training Institute Educational Center, American Safety and Health Institute Certificate, British Safety Council Certificate in Occupational Safety and Health, NEBOSH National General Certificate in Occupational Health and Safety, UK NVQ Level 3 in Occupational Health and Safety, National Compliance and Risk Qualifications (NCRQ) Level 6 Certificate in Applied Health & Safety Or an equivalent qualification accepted in your home country. National Safety Management Society, American Society of Safety Engineers, National Safety Council, Nevada SCATS, OSHAcademy, Wisconsin Indianhead Technical College, Texas Engineering Extension Service, College of Southern Nevada OSHA Training Institute Educational Center, American Safety and Health Institute Certificate, British Safety Council Certificate in Occupational Safety and Health, NEBOSH National General Certificate in Occupational Health and Safety, UK NVQ Level 4 in Occupational Health and Safety, National Compliance and Risk Qualifications (NCRQ) Level 6 Certificate in Applied Health & Safety Or an equivalent qualification accepted in your home country. A person at least 40 years of age with approved academic qualifications like Masters Degree with minimum of 10 years relevant responsible experience of environmental health and safety management or has given distinguished service to industry or education. The Council shall have the power to award Doctoral Fellow to qualified applicants or persons of eminence in art and science of environmental health and safety management. The Doctoral Fellow member shall enjoy such privileges as many from time to time been determined by the Council. The applicant’s must be at least 40 years of age with minimum of Masters Degree and 15 years relevant responsible experience of environmental health and safety management or has given distinguished service to industry or education. Note: The holders shall have the opportunities to use the word Dr. before his or her names and FCIEHS after her names.